Secret Cinema February 2016 Preview | Cinema, etc. Secret Cinema is a company that puts together immersive film-based experiences, set around one film. You step into an alternative reality and live in the film for a few hours, somewhere along the line actually watching the film too. Having thoroughly enjoyed the Star Wars Secret Cinema earlier this year, my first Secret Cinema event, when Secret Cinema announced their next project was coming in February 2016 I instantly put my name down for tickets. The biggest difference this time is that nobody knows what the film is. We’ll be stepping into a world of the unknown, much like the older Secret Cinema events. A lot of people have rushed to buy tickets but are now wondering what exactly they’ve signed up to. So what clues have they given to us? Let’s break it down. What films won’t it be? I think we can safely rule out any film that Secret Cinema and Future Cinema have already performed. The following films have already been covered. Quite an extensive list there. It’s a shame some of them have already been done and may never be repeated. The videos of some of them have been reported recently on the Secret Cinema Facebook page. The Third Man looked particularly immersive. What clues have we got? Perhaps the biggest clue as to the content of the film is the fact it is simultaneously being played out in London and Moscow. Secret Cinema regularly performs in London, but Moscow seems to be significant. These films are all fine, but the Moscow connection is tenuous at best. The Bourne series could be the best option. However, they simply don’t fit the cult film status that you could categorise all the previous films as. Throughout all the visuals about the event have been suggestions of spying and surveillance. Going to the official page on the website, you are greeted by audio that sounds like a submarine sonar blip, with someone typing on and old-fashioned typewriter overlaid. These also feature on some of the visuals. These quotes imply some kind of war theme, or perhaps people being oppressed or under over-zealous surveillance. There are also hints of revolution against it. So what are the best bets? It is unlikely that the film won’t be English-language, but not impossible. What if the film wasn’t language-dependent at all? Silent films would be a bold move but one that could pay off if it was the right film. 1924 film Aelita from director Yakov Protazanov is an early silent film and is often cited as an influence on Fritz Lang’s Metropolis. Based on a novel by Alexei Tolstoy, it features heavily topics of sci-fi but its setting in 1920s Russia allows themes of political and social commentary that meant it was banned from cinemas in the Soviet Union. You can watch the whole thing for free here. I also found an excellent article on the film by Andrew J Horton at this location. A fascinating read. I’d love to see this but in all honesty it seems highly unlikely. 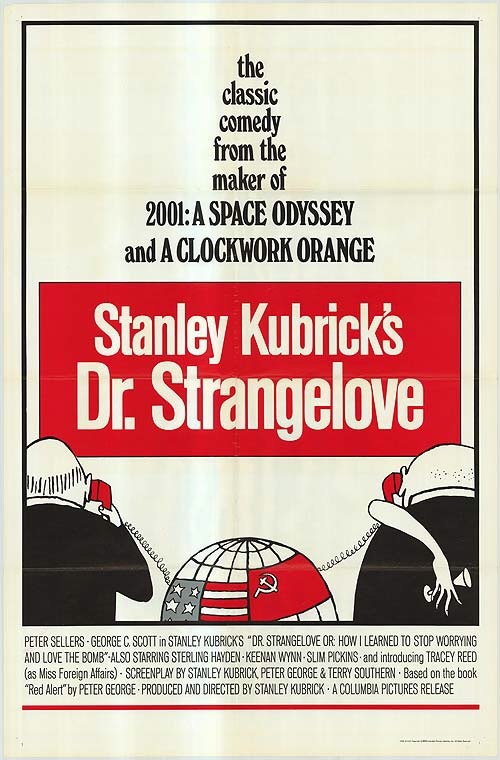 One film that seems to be cropping up in discussions across the Internet is Stanley Kubrick’s Dr. Strangelove or: How I Learned to Stop Worrying and Love the Bomb. The satirical comedy from 1964 certainly has the surveillance and war themes running throughout and is also considered a cult film by many. Its 99% rating on Rotten Tomatoes shows it would be a popular choice. The opportunity to witness a live recreation of the war room scenes would be hilarious. However, how they would skip between the war room and the B-52 bombers is a mystery to me so I’m not convinced this is the best option. Before George Lucas took on the universe with Star Wars, he had an extremely popular cult film called THX 1138. A little thought makes this a real possibility. The tickets on offer come in two categories: Operative (standard) and Operative X. The latter comes at twice the price, but the use of the word Operative brings the suggestion of a dystopian reality where names are gone and people are just a number. The lead characters in THX 1138 included the titular character played by Robert Duvall, an operator in a factory building android police officers, and SEN 5241 played by Donald Pleasance, a CCTV operator in charge of surveillance. Both are operatives but one has a distinct superiority over the other. The world would be immersive if done properly. Imagine plentiful android police wandering around and telling us to not do certain things. White rooms with seemingly no walls with everyone wandering around aimlessly. Whether enough people know of the film to really enjoy it is another matter. For me, this is a strong contender based on what we currently know. The final option considered is 1984 (Michael Radford, 1984). If you’re going for a surveillance-themed film then you can’t go wrong with this film. It is the quintessential film and book on the topic, so much so that the words “Big Brother” are used in common vocabulary to describe anything the public seems to be over-bearing on the surveillance front. 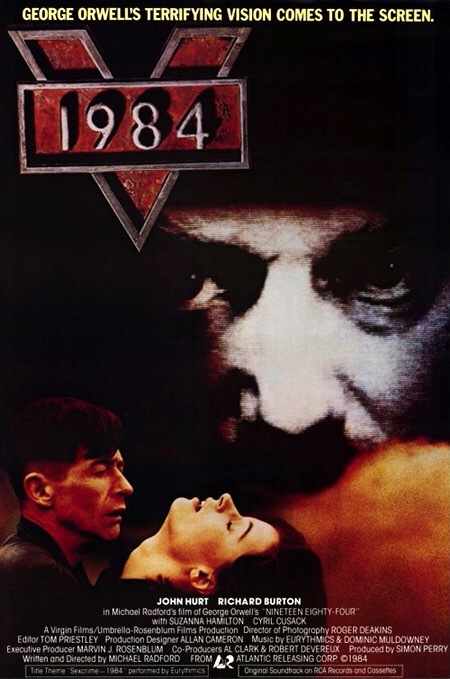 The totalitarian state rules the world in which it is set, and the main character Winston Smith (John Hurt) works for the Ministry of Truth rewriting history to suit the desired story. The settings would be much easier to achieve than THX 1138, and it is slightly more mainstream than that film. Imagine being sent into a huge office block to rewrite a scandalous news story into something far more saccharine. The dystopia on the outside of the buildings and attempting to avoid capture by the Thought Police… All very appealing! The only downside is the similarity to the film Brazil, already featured in a previous Secret Cinema event. Well, nothing is nailed on and their clues don’t really help too much, but there are some strong contenders I wouldn’t mind experiencing. Hopefully this article has got you a little more excited. Tickets are almost gone but some nights have limited availability. I’ve written an update following the recent communications. Check it out here. A preview for the next event, Secret Cinema Presents 28 Days Later, can be found here.